More information about the Southwest Art 2013 Wall Calendar. Southwest Art Wall Calendar: This wall calendar for 2013 features 12 colorful, contemporary paintings by well-known artist Diana Madaras. 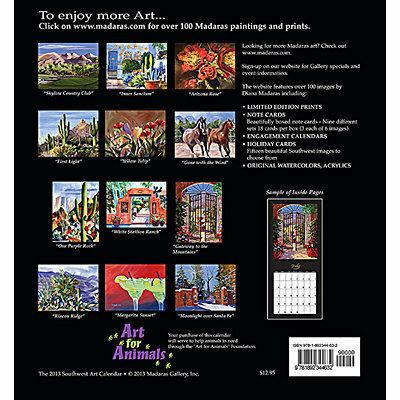 The 11"" x 12"" format captures the romance and beauty of landscapes, animal and unique architecture found in the Southwest Desert. Plenty of room in each square for notes. EAN: 9781892344632"